WordPress is the most popular CMS (content management system) in the world. It allows you to easily get your site or blog up and running. After installation, you can manage almost everything in an easy web interface. In this guide, we will go over how to install WordPress on an Ubuntu 14.04 server. For the web server component, we will use nginx, a powerful and efficient web server that has seen wide adoption due to its performance capabilities. Before you begin with this guide, there are a few procedures that you should undertake. First, you will need a non-root user with sudo privileges. You can run through steps 1-4 in the Ubuntu 14.04 initial server setup guide to create this account. You will also need a LEMP (Linux operating system, Nginx web server, MySQL database, and PHP processing) stack installed and configured on your server. You can learn how to install and set up the necessary components by following our guide on installing a LEMP stack on Ubuntu 14.04 here. When you have finished with the steps above, you can continue. 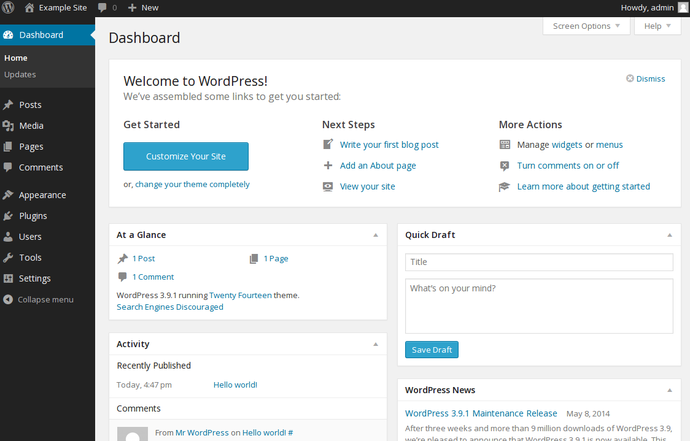 The first thing that we need to do to get started with WordPress is to prepare our database. 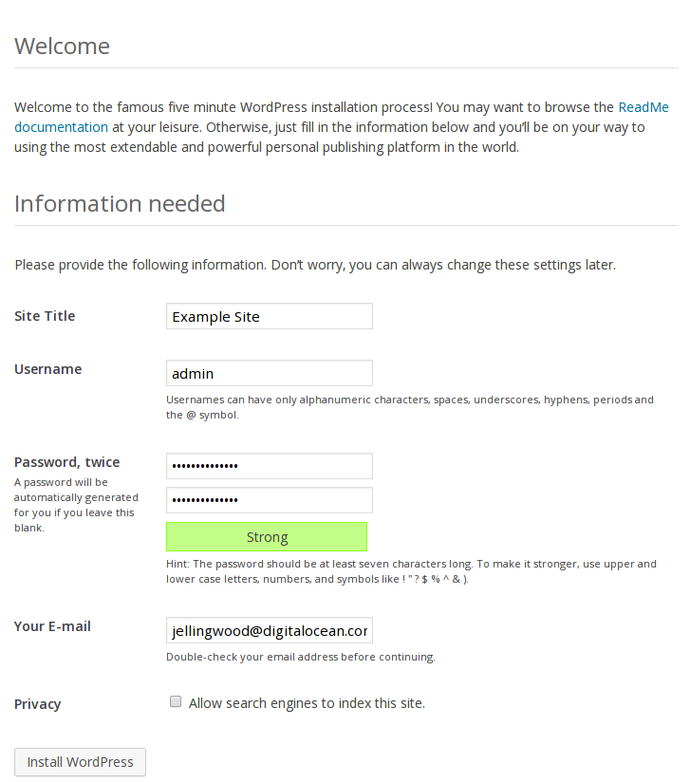 We have the MySQL database software installed, but we have not created a database for our WordPress information. 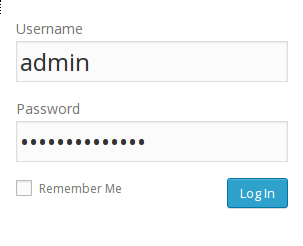 We also need to create an account that WordPress can use to access the database we will be creating. You will be prompted for the password that you chose for the MySQL root account when you installed the software. You will be given a MySQL command prompt. Note the semi-colon (;) that ends the MySQL statement. Each MySQL statement must end with one, so double-check that if you are running into issues. We have a database now, so we are ready to create a user account. We will then hand over control of the database to this new user so that our application can interact with the database. This system of creating a separate database and user for each application helps keep our data separate from other data being stored by MySQL, which is good for security and data management. Now we are back in our command prompt, ready to move on. Next, we need to download the actual WordPress content onto our server. This is available on the WordPress website. This will create a directory called wordpress that contains the site files. These two packages allow you to work with images and install/update plugins and components using SSH respectively. We have the files now, so we can start to configure our WordPress instance. When we open the file, our first order of business will be to adjust some secret keys to provide some security for our installation. WordPress provides a secure generator for these values so that you do not have to try to come up with good values on your own. These are only used internally, so it won't hurt usability to have complex, secure values here. It is important that you request unique values each time. Do NOT copy the values shown below! These are configuration lines that we can paste directly in our configuration file to set secure keys. Copy the output you received now. The file is now suitable for our needs; it is just lacking the information to connect to the database we created. The parameters we need to set are DB_NAME, DB_USER, and DB_PASSWORD. When you have made the changes above, save and close the file. We have our changes to our config files. The next step is to copy them over to our document root so that our web server can find and serve them. We will use the rsync utility to do the transfer. This has the advantage of preserving permissions, ownership, and ensuring data integrity. The location of the default document root of nginx on Ubuntu 14.04 is /usr/share/nginx/html/. However, we are going to set up our document root in /var/www/html/ to avoid modifying a directory location that is controlled by the nginx package. We will change this in our nginx configuration a bit later. This will recursively copy the contents of our ~/wordpress directory into our document root. The issue with the directory structure as it stands now is that all of our files have user and group ownership assigned to our regular user. This is fine, except that our web server needs to be able to modify certain directories and files. We can give this permission without exposing too much of our system by giving the group that our web server runs under group ownership of the files. We can then open up group permissions slightly as needed. This will give our files the necessary ownership. We have our files and directories configured. Now we need to modify our nginx configuration to serve the content correctly. Change the value of the root directive to point to our new document root at /var/www/html. Modify the index parameter to look for an index.php file before the other files. Change the value of the server_name directive to point to your server's domain name or IP address. Adjust the try_files within the location / block to send requests to PHP when they do not exactly match. Some of these might already be set from your LEMP installation. When you are finished with these changes, save and close the file. Now, our WordPress is ready to go and we can finish the installation through our web browser. If this shows your old default nginx page, you may have to refresh the page without the cache. You should now have your WordPress instance up and running on an nginx web server in Ubuntu 14.04. WordPress is a fairly flexible platform that you can use to customize your site. Experiment with some different plugins, themes, etc. to find out what works best for you.